"Waterville, Maine, Hollingsworth & Whitney Paper Mills, Kennebec River . 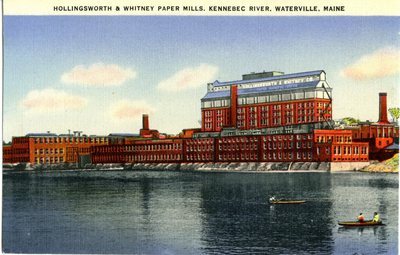 . ."
An image scanned from a postcard of the Hollingsworth & Whitney Paper Mills on the Kennebec River. Text on the card indicates a location of Waterville, but the mill was actually in Winslow, Maine. Printed by the American Art Post Card Company in Boston, Massachusetts.